Notes: Based on the 19-volume manga of the same name by Shibata Masahiro, serialized in the shoujo magazine Hana to Yume. 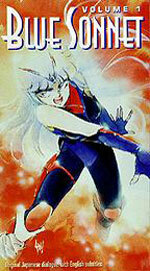 Sonnet is a super-ESPer who has been trained to use her powers for combat by a not-so-benign corporation. She is told to seek out a schoolgirl named Lan, who, unbeknownst to her also has powerful psychic powers. Well, guess what. The long-suffering Sonnet doesn't want to kill people anymore - and this is her chance to regain a sense of humanity and respect. And Lan must learn to use her growing power without being consumed by it. Will they annihilate each other in a useless struggle, or can they save themselves from those who would use their powers for evil? Blue Sonnet is another of those older titles that I didn't really expect much out of. This series surprised me by actually being rather entertaining, despite being perhaps a tad unambitious and more than a tad hokey. However, meeting this reviewer's rather low expectations might not be something to be particularly proud of. Don't go in expecting ki blasts and mega punches - though there's plenty of action, much of it is tabled until late in the series. However, do expect cool characters in the two leads. Sonnet and Lan are both quite well developed (in the character sense) and have interesting personalities as a result of their struggles with the psychic powers they possess. They also manage to avoid being stereotypical, like many bimbo female anime characters in more recent anime - I imagine that's because the source material for this series is shoujo (atypical for the genre). Actually, this whole series is deadly serious from the get-go - no silly SD sequences here, as this is pretty dark stuff that can be heart pounding at times. Unfortunately, the animation itself hasn't aged too well, considering it's only been little more than a decade since it was made. It starts at about average and picks up in a few battle sequences, but it never really gets to the point of being remarkable. Nothing glaring - it just looks old. Also, some of the scenes don't particularly seem to be plotted out well - in particular, a container ship Sonnet and Lan find themselves on at one point in the series is totally unrealistic-looking - and the interior's worse! The music is a tad overbearing in parts, too. And with all that, the concept and characters should still lead to a pretty decent series, but unfortunately Blue Sonnet just doesn't seem to gel quite right. The direction at times came up short, with some unnecessarily long scenes of character development that go nowhere, countered with some abrupt transitions that come from that same nowhere. When the action gets going, there are certainly some whirlwind moments, and then finally you get to the end...and, well, for all that time spent, it still doesn't feel finished. But it's better than the vast majority of "magical warrior" work, and if you like that kind of thing, this should be right up your alley. Still, that whole Akira Compression Syndrome sure puts a real damper on things. It seems as if Blue Sonnet aimed to be a little bit better than average, but for the lack of some oomph, it finishes right in the middle of the pack. This series is seemingly destined to languish in mediocrity, but Sonnet and Lan deserve better than that. Probably worth a rental - or if you can get it for really cheap, go ahead and watch it for yourself. But only if you don't have anything else you really want to watch instead. Recommended Audience: As Blue Sonnet is rather graphically violent, with scenes of abuse and brutality, this title is unsuitable for children and younger teens. Action fans would probably like this most.